No breakfast this morning, but we followed the road down to the coast, where we joined the main road. There is a barrier here to stop you crossing the road and the camino is off to the right somewhere. I am pretty sure that the road is easier and shorter so not too bothered. There was no sign of coffee at Cobreces but at a shop where there were tables and chairs outside they told us no coffee. We took the lower road this time and missed Cobreces altogether. Still no coffee until we reached the split at Oreña, we walked through to the bar where we had stopped twice. We met up with a father and daughter from London who were heading for Oviedo. We advised them to follow the road from Colloto to Oviedo, as the arrows will lead them astray. I forgot to mention about the lovely route from Comillas to San Vicente though. 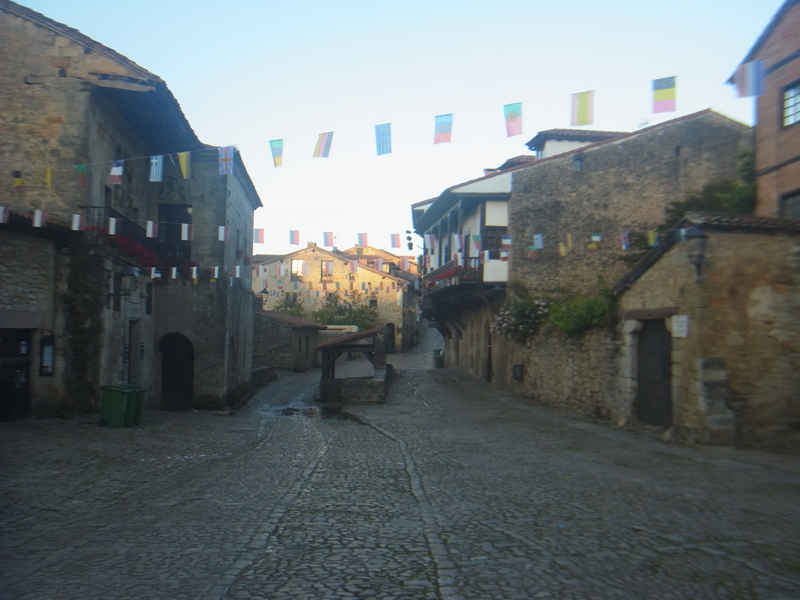 As we were returning we found the correct route out of Santillana this time. Now going in, it looked much more obvious, strange, as it is usually easier to follow the arrows in the right direction. We passed a few places to stop on the way in but thought we would stick to what we know, if it is available. It was, but now much fuller we ended up on the third floor without a balcony. We sat for a while in the main square where a lady was playing a harp. I think she was something to do with the Parador and the only place we could sit was on the diagonal opposite corner. We could listen well enough, but I am not sure that our applause reached her. Later we sat at the bar in front of the Cathedral. There is a junk shop opposite and they had a dog. There is a hole in the wall so that the dog could still run into the square whenever he wanted. He had a bell on his neck and every time someone came with a dog he would run out jangling. Sometimes he was greeted by the visiting dogs and sometimes they would see him off. The fact that he was so small and always came off worse did not deter him, he just kept coming.